I asked myself if I could skip Layout but still working only with FormZ to produce 2D drawings. I know the connection between 3D and 2D will be lost, but I don't care. Mainly I've found many issues related to this connection and found no benefits compare to the fantastic easy to use 3D modeller. Working in 3D modeller only. - create your 3D model. - use 2D section in the modify palette to create the section you want. - undo your section in the original 3D model, and save for reasons. - do all your 2D measurements, text, legenda, etc in the new 3D-2d model. - you can easily create a 3D-2d model template with override layer options (very handy for print out quality). One override layer option should be added: hatch. - the control in the 3D-2d model is far beter then in layout, my opinion. - keeping the geometrie as it was in the 3D original model, with shaded surfaces etc. Output 3D-2d model to a print. - if needed you can easily compose the drawing like you try to do in Layout. I found out staying in the 3D model is easier. - when finished just make a 300dpi pixel image of the drawing and it will keep it's beautiful texture. Anybody here working like this? - print directly from 3D model to PDF, with or without layer options). - print as a pixel image without background pixels. Now I make pixel images on 300 dpi and use these in Indesign, but I can imagine it can be done within FormZ, if printing options become better. I use layout all the time and have come to expect the frustrations that go along with it while hoping that it'll be updated and upgraded in the future. I try to post about issues i have and improvements that could be made on a semi regular basis. The way of working you describe almost sounds a bit like the workflow from version 6, hidden line renders dimensioned and annotated. I'd be interested to explore this if it was quicker than using layout - how do you do multiple elevations on a single page and how do you set up a scale. Do you ever add axonmetric or perspective views? At present I take layout created PDF into illustrator to tidy up and add further detail, title block etc. - copy 1 elevation, make a group and place it somewhere in space. - can be done with an image using a bilboard. - I found out that the tools you constantly use in the 3D modeller, you are familiar with, stil work perfectly to slice your copied 2D sections, then take a part and scale it as you like. But, in general we should think a bit different when using the 3D modeller, instead of 2D Layout. I believe the concept is simplicity. All tools in the 3D modeller are available in Layout, although layout works more clumsy, 3D modeller works wonderful, rock solid and fast. Therefore why not develop simple additions to the modeller, instead of creating another step/2D program and tell it's connected to the 3D modeller as if the connection is 'smart'. In my opinion, a problem with many CAD programs, is that they pretend to be smart. When you change something in 3D it will be changed in 2D. Well, many times it's not and you loose the control over your 2D output. With many things that are 'automatically done' you loose control. It's better to make it simple, then you can modelling in the same time you need to correct, 10 times. Of course there are limitations at this moment to work like this, but I feel these are not too big. ADS could 'easily' add some simple tools in the 3D modeller instead to focus on making Layout working. For instance see another post here about get a model into Layout and it takes long time. The answer from Tech tells me everything. It's too difficult to setup, switch on switch off... When having a deadline, we don't want to think about these issues. The 3D modeller works fast and even faster with copied 2D sections from another 3D file. It would be lovely to see the printing options in the modeller become better. Hope to get a discussion here about how we can keep it simple. Hugo, I am finding your 3D to 2D workflow interesting but there are three things about Layout that I would miss a lot. The auto update feature, ability to have multiple windows with different views and scales and multiple sheets with title blocks. Saying that, there are many bugs in Layout, I sometimes get so frustrated with it that I want to throw the whole computer out of the window but there is a lot of power in it. Layout is not a happy camper if you work with large files with many layers. It really takes a long time to update and as it takes a lot of work to set up. I look forward to seeing videos of your process. Thanks for being so generous with your ideas. Talking about a bug - I will make a new post about a current issue that is currently frustrating me :-). I noticed that you are working with Affinity Designer. I just recently came across this app and so far I am impressed with it. Compared to Illustrator it is clean fast and more intuitive to use. Unfortunately, there are some major features I use in Illustrator that they do not 'yet' have in Affinity Designer :-). At one point I was thinking of using Affinity Designer instead of FZ Layout but I modify my work so much that, that process would not work for me. let me tell about my experiences so far with all programs I use. I work with Affinity Photo and Designer, and I love it. At the moment I am making hatch images I will use as a texture in FormZ with the Affinity apps, works very well. Later this year Affinity will release the beta of Affinity Publisher (for me the substitute for FormZ title blocks and Layout). That Publisher I will buy as well. I want to get rid of the Adobe tools, like Indesign and Photoshop CS6. In general the CAD market is talking about what it can "automate" for you. Well, my experience, with automation is you have to check carefully your output anyway. Because you never know what will updated and what you didn't want. The way I always work is without automation for work which you can do easily. For instance, the 2D section I copy to a new 3D-2d model is always in the exact position as it was made in the 3D model. Annotations I make in the 3D-2d model. In the 3D model you can store some guide lines as your section placement. If there is some update needed, just make the same section in your 3D model and copy in your 3D-2d model. (what can be done is also making a component from the section you made in the 3D model if you like, but I prefer the more straight forward simple way, no automation. Title Blocks are not really what I need, because I am using Indesign for that, very good graphics output and works rock solid. Later I hope to switch to AF Publisher. Multiple sheets, no problem in Indesign. Scale, no problem. Because you can print in any scale and save it as PDF, which can be added in Indesign very easily. And if you make new prints with the same name, AUTOMATICALLY updates in Indesign. - Hatch images: working very easily as textures. Scale, repeat, all is working well and simple! - Layer override: make a 3D-2d template with the same layers as you got in your 3D model, connect your hatch textures to the corresponding layer. Done! Time saving is huge, because now we do not have to add hatches separately in the 3D model. It will be done by the layer setup in your 3D-2d template. And handy to switch on and off. - Because we are used to work in the 3D modeller (I love the 3D FormZ modeller), we do not have to get used to a limited 2D layout module. I have more benefits with this way of working, maybe I will talk about in my next update. This image is directly printed in 3D modeller to PDF. (Exported for upload here to JPG). You have given this a lot of thought and there is something about your process that I really think has merit. Since going 3D (1995), I have had a continuous battle as to how best to create documents for fabrication. The one major selling point of your process, is that you are able to tap into the power of each of applications you are using. You are still using multiple apps to get to final product but with a strong work flow method. So, in my mind, that is not a problem. I am presently unable to give your system my complete attention but when my current project is complete, I am going to run some experiments with your suggestions. Once again, many thanks for sharing your ideas. You have got me thinking . Kim, thank you for your words. Hopefully more users will get inspired. In fact, I can do this whole workflow only in FormZ 3D-2d model, no problem. For those who are interested in my WIP, here an update. From the project in 3D you'll see the result in less then 8 hours work with my method 3D2d, including some updates as well during preparation of the 2D drawings. - making sections in the 3D model. - make annotations in the 3D2d file. - prepare some print area, let's say 82x82cm, print on scale 1:100. - print every section separate as a PDF, store them to use in Indesign. - import al drawings into Indesign template. - export the Indesign file to PDF smallest size. - easy to control my workflow. - easy to copy and paste between the 3D model and 3D2d model. - print out options are a bit unhandy. - because of pixel output files they can become a bit large, but not after exporting to the smallest PDF size. I printed all drawings in a printshop and the result is ok, but for my standards I preferred 300dpi. This was not possible because of limited export in Indesign CS6. Anyway, for this moment compare to my 6 hours work without any result, I am happy to work like this. Thank you for posting this. I do not like Layout and the difficulty in getting decent drawings out of my models has prevented me from using FormZ to the full. It got me thinking and I am sure that you are correct in saying that we should be able to do what we want without layout i.e. in FormZ. Your method of cutting sections works but what I did yesterday was I printed views as pdfs to scale. You can then use a Hidden line b/w render and print that as a pdf. I then imported both into my 2D cad program. I use Powercadd but I expect this would work in other programs or even Illustrator or Affinity Designer. The hidden line render is a vector pdf so can be transformed into objects and overlaid on the full rendered image pdf. You then have an image to scale with snapable lines so you can add dimensions, notes etc. The only problem with this is that printing the rendered image to scale is not accurate. I find that I have to rescale this by 0.3% or so, which is annoying. The hidden line image does seem to be ok. 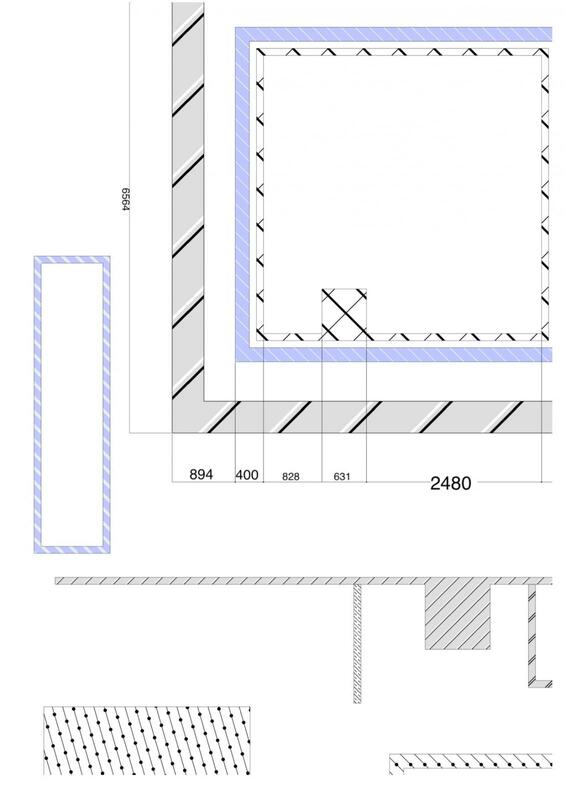 If Autodesys would allow the saving of a pdf file, to scale, of the current view and have an option that would save with it an overlain vector pdf of the hidden line or wireframe image of the same view it would solve most of the problems in producing working drawings from FormZ models. Your contributions are very interesting. It is a manual but reliable process. I want to update to 8.5 / 9 but at the moment I was afraid that my working method could not be transposable. The last point mentioned by Malcineurope (the possibility of supperposing a vector plot to an image and printing the whole to the scale remains decisive for me. In your opinion, can we imagine in Z8 modeling to place under the vector plots an imported image (that I think it is possible) and to print the whole directly from the modeler to the scale with a cartridge? Or does it have to go into LAYOUT for that? Quick and simple with very few repercussions. After enough frustration between dimensions and text in Layout, this is the best solution for me. FormZ can do a lot of things pretty well, but trying to make it be the end-all solution to a workflow is counter-intuitive. Software should be treated as tools in the design process. You can’t build a house using only hammer. ...building only with a hammer...??? If it is just a small piece in the design proces, then it is useless when you can't give that little part to another, let's say the plumber. If that transition is not working, we can start over again. I agree 3D modelling is nice, and making some nice images, can be done too. But, if you create a toolbox, with bad tools in it, you can't deliver the job! Even if it is only a small piece in the design process, as you said. The tools you create should be working well. Nothing more nothing less. I the old days we could copy and past a hidden line from 3D model to 2D, very straight forward. Then I saved to Vectorworks and made my 2D drawings in Vectorworks. But, it's just not the way it should, because a 3D model has a lot of information in itself. And, not at least the way FormZ works as a 3D modeller is wonderful. So, this means, it's a huge timesaver using FormZ compare to many other software. They are able to do some very good work, creating the 3D modeller. Why not thinking in the same way and create just that little bit of missing tools or make the tools already there, stable with enough control to get what is aspected. In my opinion it can be done within the 3D modeller! Nowadays the big boys talk about BIM here and BIM there... But, it's just a huge database! Creating a model is... still difficult compare to FormZ. And here FormZ is having the advantage, modelling. My point here: The export function to whatever print or 2D, 3D CAD files to use in another program, should work rock solid, if you can't make a good 2D tool. Making a break in 3D and 2D workflow is per definition a wrong approach. I guess I did over-simplify and not give enough credit to the formZ toolset. I’m just trying to emphasize that although the range of functions of formZ is appreciated, it’s not worth (time and frustration) trying to stretch the software beyond its capabilities. Layout is good, not great. So to make technical or styalized drawings I’ll take them to something that I personally consider to be great for that type of work. Of course this applies to many 3D design programs, not just formZ. +1 for the rock solid export functions. Thank you for your input and concerns regarding Layout and letting us know how we can continue to improve its functionality. Separating Layout into it's own application in 8.5 was the first step towards creating a more robust drafting program without interfering with the formZ modeling program. Rest assured, we are listening and we plan on making many improvements to Layout in the future! Personally I think that the concentration on Layout misses the point. FormZ will never be the final software of choice for producing working drawings. For it to become so would mean that Autodesz would have to concentrate on it to the detriment of its 3D modelling capabilities, which are great. What is needed is an easy, solid way of going from the views created in the 3D model to a base within another program for adding all the information required to produce a working drawing. This requires the output of both vector lines and also raster image produced in the model overlain one on another. Layout does not cut it because you still then have to go from Layout to another program for finishing. However, you do have already within FormZ the solution. You can print to PDF an image at scale. If you do this with a normal, coloured view you get a raster pdf. However, if you do it with a hidden line i.e. black and white, rendering you get vector lines. So by printing the same view twice to pdf with both normal and hidden line renderings you can get a raster image overlain by vector lines. This should be ideal. However, there are one or two glitches. Firstly, there seems to be a difference in scale between the raster and vector pdfs. The difference being about 0.4%. Secondly they both print with white backgrounds, which have to be removed and thirdly they do not seem to register, i.e. print in the same position, so one image has to be moved on top of the other. So my ideal solution would be an option to print a view correctly to scale with two layers, one of which is a vector layer taken from a hidden line or black and white render and the other from one of the standard image renderers, properly registered one on top of the other and with no extraneous background. Would this not be fairly easy to implement? Spending time making Layout a more robust and user-friendly drafting program will not "detriment [formZ] of its 3D modeling capabilities...." We will allocate our resources effectively to make the whole formZ package (formZ, Layout, Imager, Viewer, etc.) a great value and enjoyable experience for all of its users. • Select the .fmz file, choose your view and scale in the Frame Parameters, click OK.
Also, note that exporting/printing both a raster image and a vector image at the same time is not easy to implement given that raster and vector formats are different. That is, JPG is a raster format, DWG is a vector format. Yes I use layout. However, to get it into a program to finish off the drawing means having to go through DWG and I end up losing all the rendering that makes a drawing come to life. I am very aware that JPEG is a raster format and DWG is a vector format but you are still missing the point. You already allow printing to pdf to scale and pdf can be both raster and vector. Print a shaded rendered image to scale in pdf and you get a raster image. Print the same image rendered using the hidden line render to pdf and it is a vector file that you can then edit or snap to in another program eg. Powercadd, Affinity Designer, Illustrator or any other similar program that can work with vector pdfs. By laying the vector file over the raster I get a super snapable image. You seem to have all the tools already in place. I would just like to automate the process and solve the registration and scaling issues. We will look into this in the future. Thanks for the suggestion!